SOS Camps! Keep Visible with Tees and Bumper Stickers. - SOS Camps! 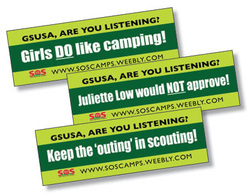 Save Our Girl Scout Camps. Please note: We offer these items through Cafepress as it is the easiest way for us to make them available a broad audience. We have the markup set to "0" on all the Cafe press items to make them as affordable as possible, placing visibility over fund-raising. We will happily make the artwork available to your group, or customize the art for your area at no charge if you wish to have anything produced locally. Just email us with your request. Visit our SOS store at Cafepress for a large assortment of tees, bumper stickers, and buttons. Shine a light on camp closures across the US with these bumper stickers. Six different messages available. SOS logo reads "Girl Scout Camps Across the USA" inside the "O"
Your FB cover can now be as happy and helpful as your car bumper! Download a Facebook cover and ask the question: Are you listening GSUSA? ?